 Gadjo Dilo are a unique music group created with the sole purpose of reanimating the manouche gypsy jazz musical tradition. Their source of inspiration is the great gypsy jazz guitarist Django Reinhardt, characterized by all great jazz musicians – without exception- as a genius. Django’s artistic and personal journey and the old jazz sounds of the 30’s and 40’s are listed by Gadjo Dilo as their basic influences. In their first two albums, “Manouche de grec” (2013) and “Manouche de grec vol.II” (2016), they try to explore their love for Django, as well as their love for the older Greek songs. The band’ s live performances release the magic of the gypsy jazz tradition, giving off a Greek scent and reviving an older era. Gadjo Dilo communicate their energy to the audience and inspire everyone to dance and sing along. Their live set also includes original tunes, American jazz standards, and French songs of the Interwar Years.